The following essay was written as a response to an article titled "Farm to Fable" in the Tampa Bay [FL] Times, part of a comprehensive series written by their food critic, Laura Reiley, on the reliability of sourcing claims made by restaurant, farmers' markets and retail stores. You can read other local responses to the article at LetUMEat. When I tell someone I’m a food writer, often the first thing they say is, "Oh, so you're a restaurant critic?" And I have to say no, I don't know enough about food to be able to criticize professionals; I'm just a home cook who loves to eat. An enthusiast, if you will. What I do care about when it comes to restaurants is truthfulness. As a food writer who tries to tell informative stories about how our food gets from the fields—or forests or rivers or oceans—to our plates, it's important to me that readers get accurate information so that they can be more informed consumers. 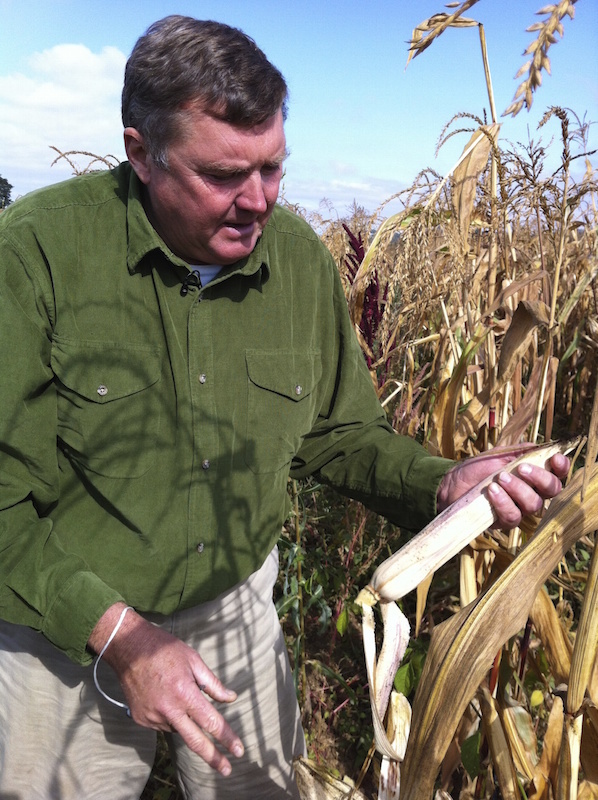 The real deal: Gathering Together Farm produce. When, as in the examples that Laura Reiley cites in her story in the Tampa Bay Times, restaurant owners and chefs obfuscate, stretch the truth or outright lie, it undermines the power that we have to make informed decisions about what we eat. In one example that I ran across recently, when a supermarket chain posts a billboard saying that their beef has never seen a feedlot, but they're only talking about the 100 percent grass-fed meat in their butcher cases—which, by law, must be fed only grass from weaning to slaughter—that's confusing to their customers who then think that none of the meat in the case has been fed the GMO corn and soy, along with antibiotics, that feedlot animals are given before slaughter. 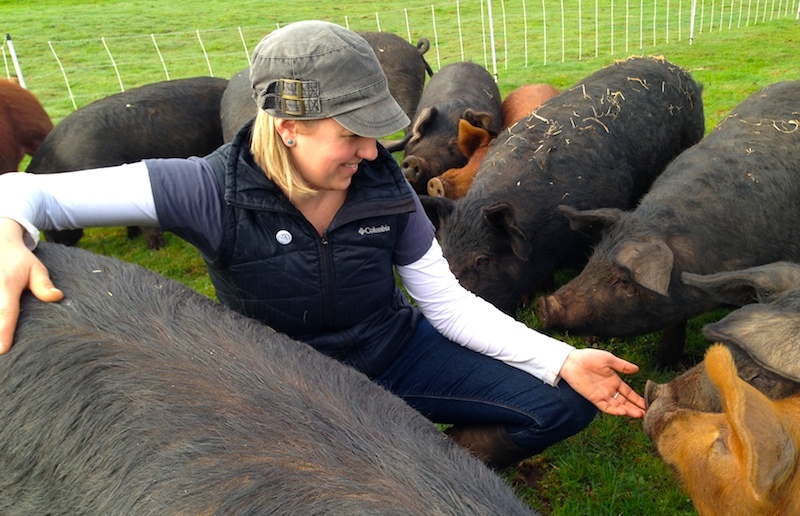 The real deal: Kendra Kimbirauskas of Shimanek Bridge Farm. Likewise the local restaurant that has a blackboard touting a list of the local farms they buy from, when it's January and 90 percent of those farms don't have crops available at that time of the year. Or restaurant menus that state their meat is bought from suppliers that have the word "Farms" in their names, but those "farms" are just a slaughterhouse that processes factory-farmed meat shipped in from hundreds or thousands of miles away. Or a "farm" that raises its chickens in closed buildings with a barely passable vent to the outside, birds that spend their short lives in litter that is contaminated with their own urine and feces. The real deal: Anthony Boutard of Ayers Creek Farm and his organic flint corn. 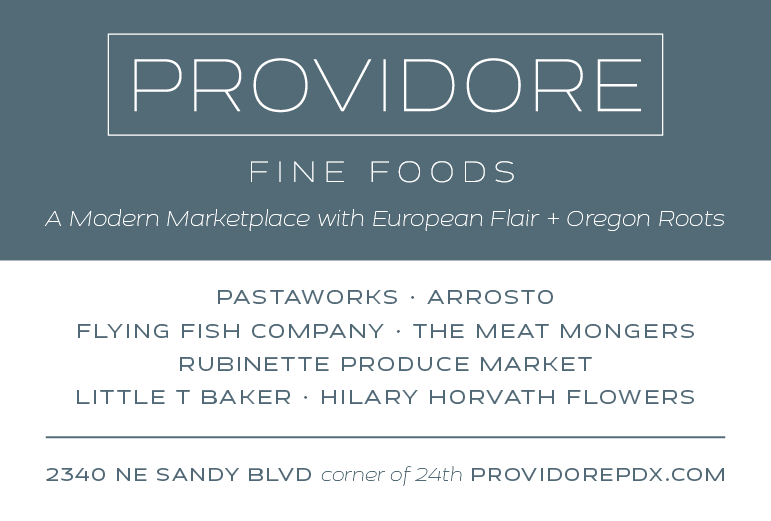 Fortunately for us here in Oregon and the Northwest, good sources of food are plentiful for both home cooks and professional chefs, from farmers' markets—60 and counting in the metro area at the peak of the season—to farms, fishing boats and ranches that make their living from direct-to-consumer and retail sales. We also have a plethora of organizations that promote and encourage small family farms and beginning farmers, as well as nascent efforts to bring chefs together with seed breeders and farmers to grow more marketable, tastier crops. And there are many, many restaurant owners and chefs who wage the daily struggle of ordering and scheduling deliveries from dozens of sources, and who shop the farmers' markets for the freshest ingredients for their customers. As Ms. Reiley writes in her article and is reiterated in Leah Scafe's response, it's up to us to be informed consumers, ask questions and hold our food sources responsible as much as we can. And that is what is going to change our food system, both locally and nationally, into a much more workable, healthy and sustainable one. 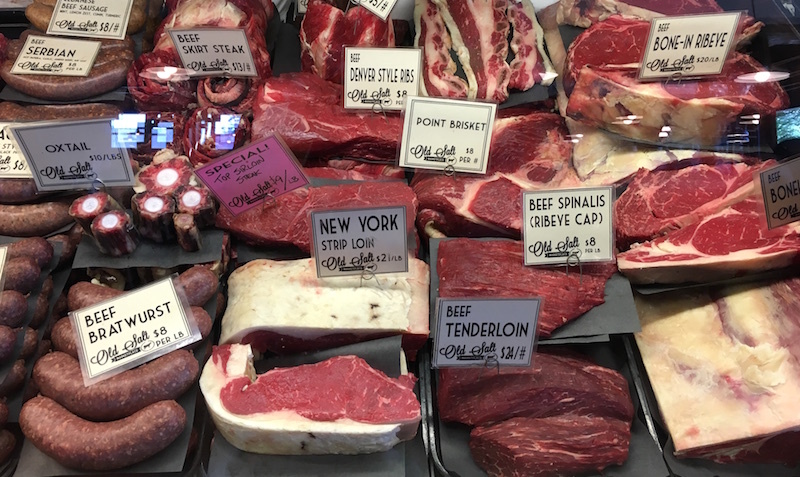 Top photo: The sustainably sourced meat case at Old Salt Marketplace with pasture-raised beef from Bill Hoyt's Hawley Ranch in Cottage Grove. It is a sign of our times that the conditions in which and means by which our basic everyday things were made are totally hidden from us. Who would pick up a plastic clamshell of blueberries if they had to take it from the hands of a suffering Triqui picker, looking straight into their eyes? 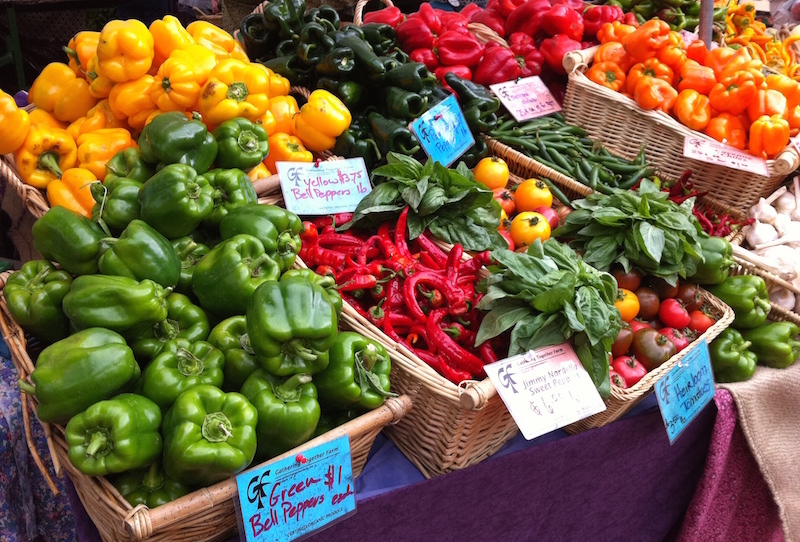 The increasing popularity of "local food" will bring this problem home to our scene. We should expect all kinds of vendors to dissemble the food they sell. I'm glad somebody will speak out about it and I hope it galvanizes the rest of us to be more critical. But the problem is nothing new, especially for imported goods, where the unstated deception is even more egregious, considering, for example, the suffering that bolsters our industries in chocolate, coffee, cane sugar, tea, and so on. We maintain preferential trade deals in sugar with the Dominican Republic, whose plantations depend upon Haitian slave labor, e.g. It is our responsibility to become informed about those basic foods we once took for granted; to ask the right questions, vigilantly; to cherish and promote good food when we can have it; and to reject and reform those industries that will not be held accountable for their growing and labor practices. This will include a fair deal of renunciation and abstinence from many foods we may have been raised with, or come to depend upon for the varied and indulgent diet we maintain on the whole, as Americans.